While combing through our past IKEA kitchen designs, we stumbled on an interesting tidbit: nearly 87% of our kitchen design customers in the past two years didn’t want a backsplash included in their kitchen design. That’s right! Nearly nine out of ten Inspired Kitchen Design customers decided against using a backsplash in their IKEA kitchens. Our customers aren’t even interested in some of the more modern takes on the typical backsplash: placing their backsplash material right up against the countertop, or running their granite or quartz countertop all the way up to their wall cabinets. So why are so many of our customers just saying “no” to the backsplash? Backsplashes make your kitchen look passé. No matter your kitchen design style, no matter what materials you use, the trend these days is not to use a backsplash. Those of us at IKD know it and IKEA kitchen customers know it, too. 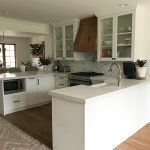 Lots of our customers are going to do their own installation, which is a serious undertaking even if they aren’t creating their own quartz or granite countertops. to provide an easily cleaned surface behind your stove in the event of food stains. The general consensus these days is that if your walls are in good condition, you simply don’t need a backsplash. It’s all a matter of personal preference. 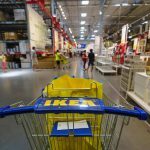 Customers choose IKEA because they want a functional kitchen, and they aren’t impressed with design elements they see as unnecessary. Your countertop fabricators should take note! This design trend has been a blessing for IKEA customers, who still get the ease of installing their own countertop materials without the hassle of cutting and installing a backsplash. What about your kitchen remodel ? If you’re not sure what’s right for your kitchen remodel project, you might want to consider checking out our kitchen design service. The whole design process is done online so you don’t need to spend hours cueing at IKEA to talk to someone who isn’t even a professional kitchen designer. We work with you to ensure your IKEA cabinets, countertops and appliances come together to create the desired look you’re after. Even if you do or don’t want a backsplash! Start your IKEA kitchen design today.